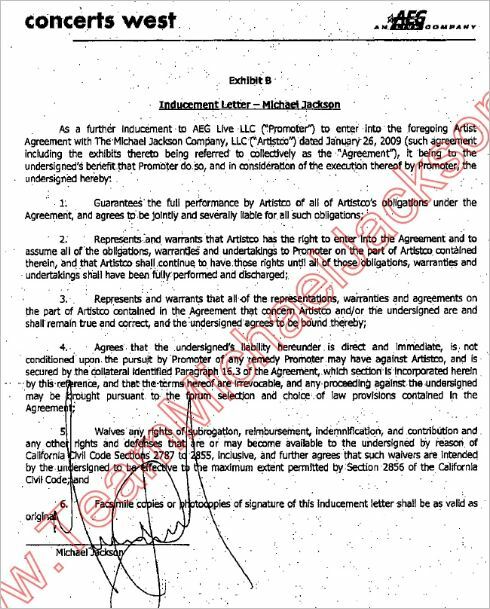 Dear readers, over here you will find the full copy of the AEG Live so-called contract with Michael Jackson (with my notes to it). The full copy is difficult to find. The variant published on Radaronline is heavily redacted and is missing the attachments which are an essential part of every contract. As to the AEG papers their attachments to the agreement are absolutely crucial for understanding the whole thing – without them the agreement will tell you a totally different story. 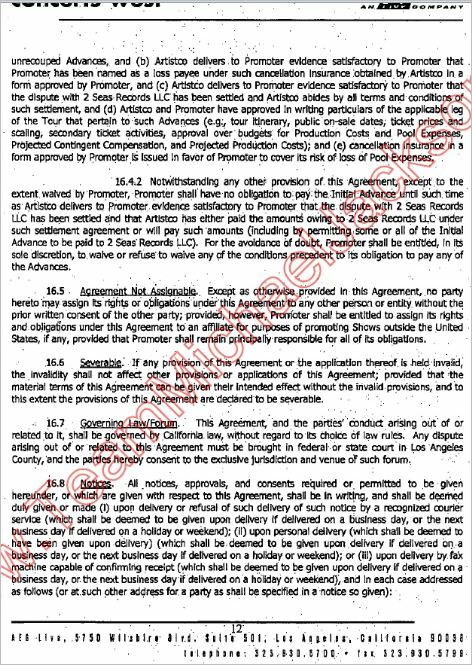 Full variants of the agreement are found in the amended Joe Jackson’s suit against AEG Live posted by TeamMichaelJackson.com: http://www.scribd.com/doc/59105659/Notice-of-Motion-and-Motion-for-Leave-to-File-First-Amended-Complaint-FULL-AEG-CONTRACT-P43 . You can also find it in Leonard Rowe’s book “What Really Happened to Michael Jackson. The Evil Side of Entertainment Industry” on Jetzi site: http://jetzi-mjvideo.com/books-jetzi-04/10wrh/10wrh0a.html . Let me say it again that when studying the AEG “contract” it is essential to look at all the papers in their unity. Generally speaking if duly made all attachments to a contract form an integral part of it. Therefore each page of it should be in conformity with all the others. If they are not, so much the worse for those who have designed these papers. I hear that Joe Jackson’s suit has just been dismissed by the judge. Superior Court Judge Yvette Palazuelos agreed with AEG’s attorneys that he should have simply joined his wife Katherine in her suit against AEG instead of filing a separate one. This is AEG’s first major victory – Joe’s suit was much more substantial, serious and to the point. And AEG knows it. 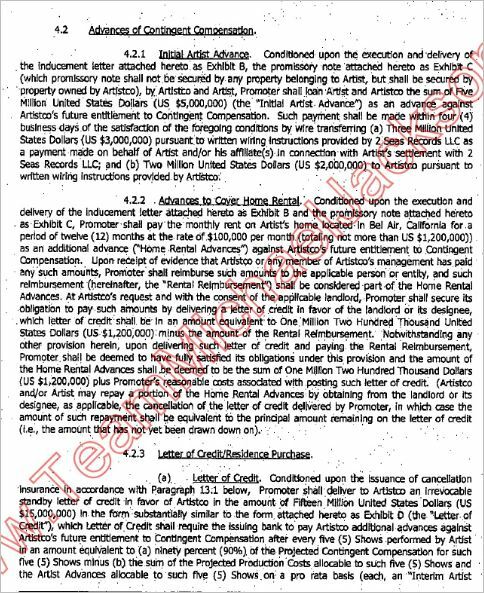 Here are the screenshots of the AEG Live agreement taken from the above three sources (thanks to David we have some pages of Leonard Rowe’s book too). They are provided for your individual study and will have only some of my spontaneous comments. The first page of this document carries the date of January 26, 2009. It comes in the form of a letter addressed to “Dear Dr. Tohme” which makes us think that this paper is not actually a contract, but a Letter of Intent . The capacity in which dear Dr. Tohme is present here is not specified, so what he is doing in the deal is not clear. The letter starts with insignificant matters instead of essential things like the subject of contract, obligations of both parties, number of shows, duration of the tour and other clauses required of a formal agreement. This betrays the fact that we are at the preliminary stage of the negotiations only. 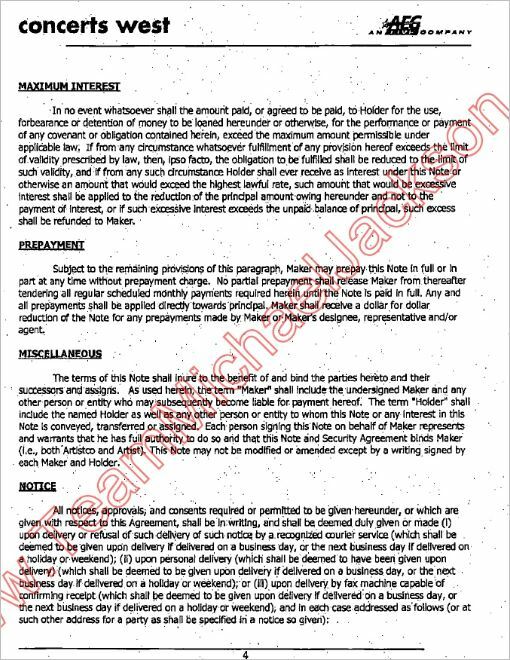 The main definitions on which the interpretation of the deal wholly depends, are promised to be stipulated “herein” and/or in Exhibit A (the attachment stating definitions). Such an attachment may have been even non-existent at the time of the letter and may have been added to it at a later moment, thus drastically changing the meaning of what Michael was looking. What page 2 essentially says is that everything, including the number of shows, is the matter of discussion between AEG and MJ’s company and not Michael Jackson himself. The company represented by Tohme (?) preapproves (preapprovement is not final) the number of shows up to 31, but no less than 18. Various conditions, which sound more like an ultimatum to me, explain the clearly preferential rights of AEG by the need to “recoup the advances”. As regards the Artist’s Compensation you will never be able to understand what it is unless you see the “Definitions” attachment (provided below). The contract does speak about “Contingent Compensation” but what all those “pool revenue”, “pool expenses” and “production costs” mean will become clear only when the attachment explains it. Let me repeat that the attachment was made we don’t know when, as it carries neither a date, nor signatures. More about it here Michael Jackson’s agreement with AEG – FRAUD IN THE ARTIST’S COMPENSATION. part 3. Page 3 sets conditions for giving to the Artist the Initial advance. These include signing the Inducement Letter and Promissory Note. $5 mln. of the Initial advance will be transferred upon settling the matter with the Prince of Bahrein – his company 2 Seas Records should be wired $3mln. out of the sum. The remaining $2 mln. will go in the direction instructed by the Artist’s company (not MJ). The house will be rented for 12 months though at least half the time the Artist will be away (why the need for a full year then?). The Artist’s company is to first pay the rent, and then the sum will be reimbursed to it by AEG from the Letter of Credit opened by them. Payment by a L/C means that $1,2 mln. is not cash money but a sum frozen in the bank. It will become accessible to the Artist’s company only when the paid rent bill is submitted to the bank after which it releases the necessary portion of money to cover it. In the same way AEG also “freezes” $15mln. for future payments to the Artist’s company (not the Artist). This money is meant for the shows already performed. The Artist’s company is represented by Tohme as he will be signing papers “on behalf of the Beneficiary” which is MJ Company LLC (see exhibit D for proof of it, please). Out of the $15 mln. frozen in the bank the Artist’s company will get money for every 5 shows done, after a certain share of production costs and advances already made are deducted by AEG. Out of the little remaining 90% will be paid to the Artist’s company (not MJ). AEG prefers to call payments for each 5 shows “additional advances” though it is actually the money earned by the Artist. This play of words is essential for AEG as their deal is based on the idea that if they terminate the contract (at any time) all “advances” are to be returned to them – even if it was actually payment for the shows already performed. Thus the Artist’s company is constantly given “advances” only (and not just an initial advance followed by payments for the job, as you and I would imagine). The difference is that payment for the job done is not to be returned, while the “advance” money is! Now the whole thing becomes even more intricate. 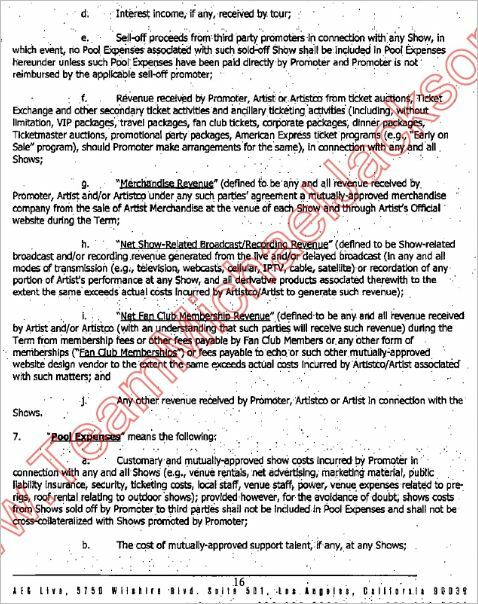 Pages 3 and 4 call the above payments for the shows already performed “Interim Advances”. It explains the complicated procedure of calculating these sums, and this – among other things – means that instead of relaxing after the strenuous shows the Artist is to “execute written statements” verifying that 5 shows were done and checking up the humiliating calculations. After that the Artist’s company either draws the money from the bank, or AEG (interesting point!) “at their election” chooses to pay directly to the Artist’s company. Given that AEG will pay what we consider to be earned money, but they consider to be advances (which can be asked back any minute) this point acquires a strange meaning – whether you like it or not AEG can “at their election” pay directly to the Artist’s company? And then its management (Tohme) can direct the money where he sees fit, while the Artist will still face the possibility of having to repay the “advances” back? Or is this possible course of events the result of my vivid imagination only? 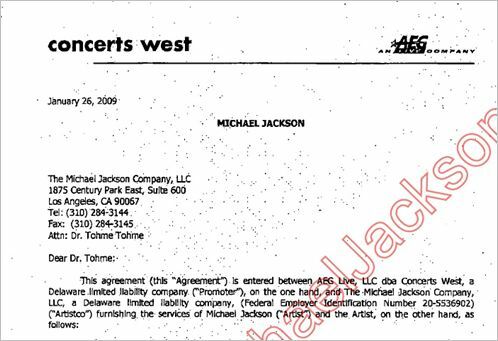 After every five or more shows AEG also has an option not to remit those “advances” to the MJ Company’ s account, but give the company (Tohme) cash to buy a certain residence at a designated address. The nuance is that if we consider this money to be earned, the Artist can spend it without any control from AEG, but the problem is that AEG considers it advance money, so in return for their kindness they want a Promissory Note again (for the cost of the house now), another security agreement and the right to receive title to the house in case the Artist fails to pay back those “advances”. Another important point is that the money for the house will be given to the Artist’s company from the $15mln. frozen in the bank only if the Artist agrees to the conditions stated in clause 16.4.1, one of which requires him to approve the itinerary for the next leg of the tour. So all this talk about the house is clearly a way to pressure the Artist into taking decisions favorable to AEG – you don’t approve the itinerary, we don’t give you the money. The next page (page 5) says that the Artist’s company cannot receive more than the agreed $15mln. If we consider it advance money this is understandable, but if this money is earned by the Artist this limitation looks somewhat strange. Clause 4.2.4 confirms that AEG regards the money for the house (from the $15mln. limit) as a loan. If the Artist asks for more money which he has already earned during the tour, AEG may in their sole discretion pay him additional money, but will consider it to be advance money again. All these so-called advances taken together will naturally have to be returned if certain circumstances arise. It is rather strange that even though paid to the Artist’s company they will be considered “Artist advances” (or the advances given to the Artist individually). Given that all money will be received solely by the Artist’s company managed by Tohme, and the Artist will be individually responsible for the advances, this point seems to me terribly dangerous to the Artist. What if Tohme embezzles the money and the Artist is forced to pay it back? 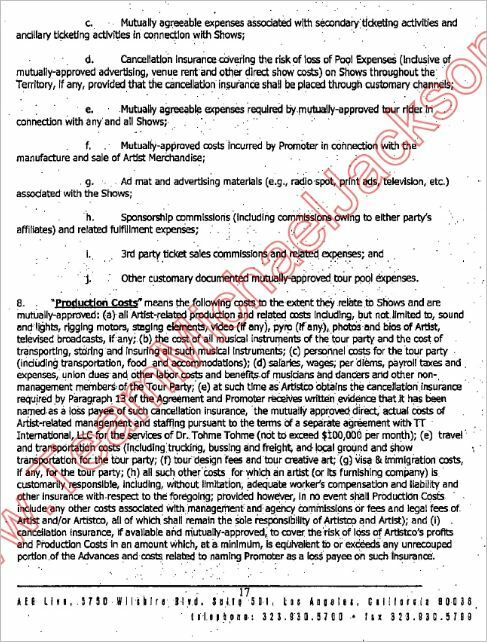 “Promoter shall be entitled to recoup all Artist Advances from Contingent Compensation earned by Artistco…”. Why is it always the Artist’s company which “earns” and always the Artist who is to pay, while in reality it is the other way about? 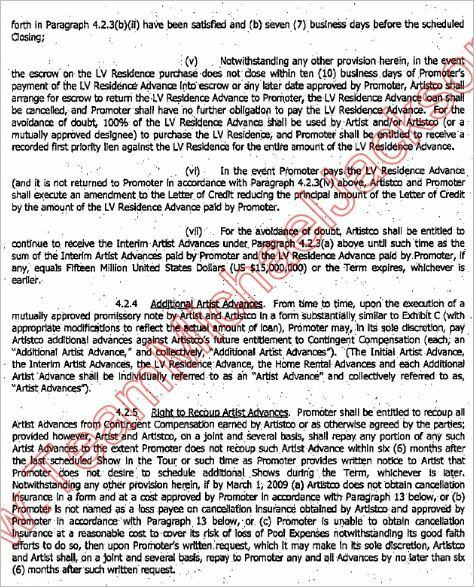 Page 5 also says that if the Artist’s company does not obtain a (medical) cancellation insurance by March 1, 2009 at a cost approved by AEG, or if AEG is not named the beneficiary (loss payee) of such insurance, or if AEG itself does not receive an insurance for “pool expenses”, the Artist and the Artist’s company are to return all the advances no later than 6 months from AEG’s written request. The next page states exceptionally scarce AEG’s responsibilities. 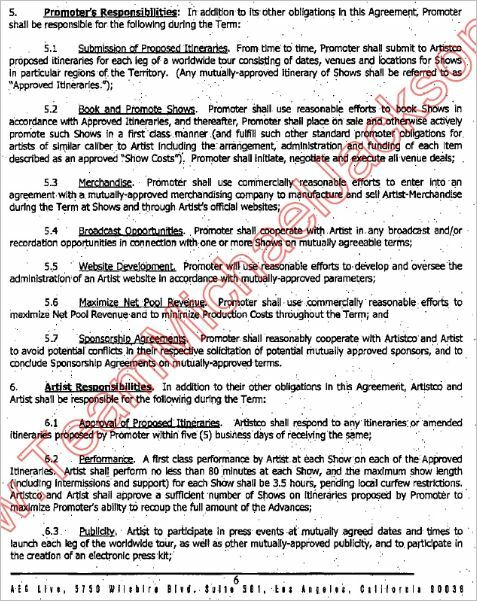 The responsibilities of the Artist’s company and the Artist include the first-class performance by the Artist and approving “a sufficient number of show on itineraries to maximize the Promoter’s ability to recoup the full amount of the Advances”. The next page (page 7) says that the Artist is also to execute the Inducement Letter attached as Exhibit B (for some reason no word is said about the Promissory Note accompanying it). Clause 6.8 on this page is VERY IMPORTANT. 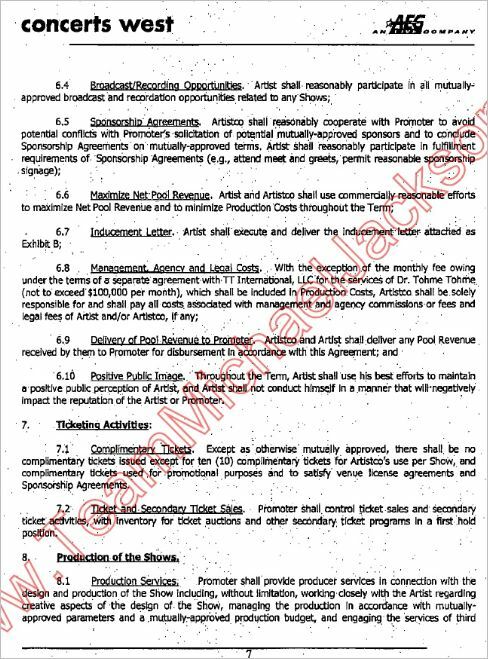 It says that the Artist’s company will be responsible for all costs of its management fees except the monthly fee to Dr. Tohme Tohme. This fee is to be included into Production Costs. and this in its turn makes us think that Production Costs are not the Artist’s responsibility either. The “Definitions” attachment (Exhibit A) will give a different interpretation to the above ideas, however that paper is of dubious validity as it doesn’t carry any signatures or dates. Besides the huge discrepancy between the contract and its attachment as to who will pay Tohme, the fact that he is supposed to be working for Michael Jackson, but will not be paid by him (according to the text of the ‘contract’) makes us wonder – and who was Dr. Tohme working for then? Out of the two parties mentioned in this document? “Production of the shows” (pages 7, 8) is another CRUCIAL CLAUSE and will require a detailed comment. It innocently starts with what we always expected of AEG – they will provide “producer services”, will employ third party vendors in the show production and will manage production “in accordance with mutually approved production budget” . 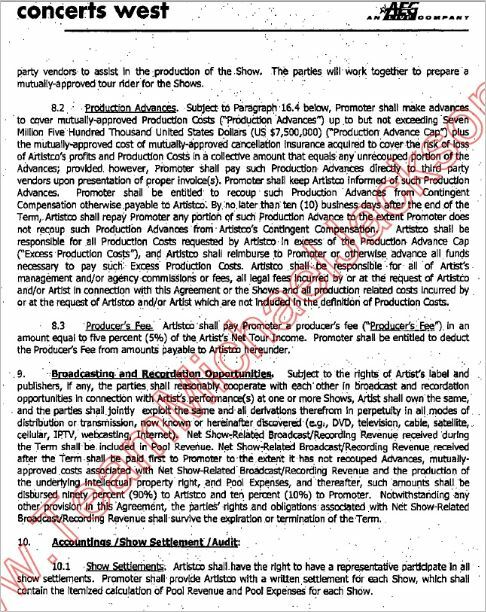 This, together with our earlier understanding that the production costs will be AEG’s responsibility, creates the illusion that AEG is sponsoring the show within the agreed budget. Their responsibility for producing the show looks so obvious that it never dawns on us to ask a question – and to whom are they making these advances? As regards the Production advances for $7,5 mln AEG only says that they will “keep the Artist’s company informed” of them. A nice way of putting it, isn’t it? Especially if the Artist later finds out that he is responsible to cover all Production costs! 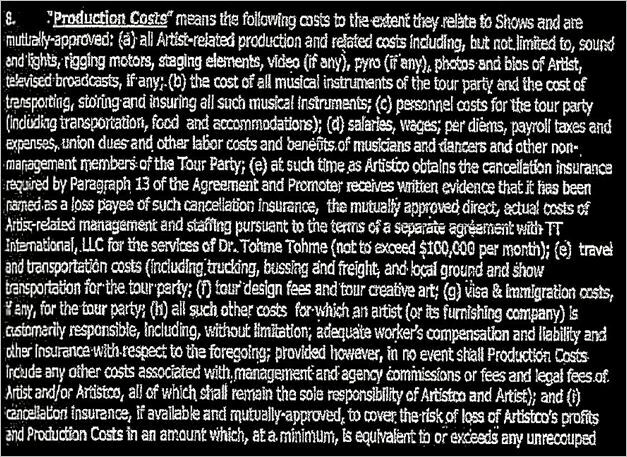 To be fair to AEG there is one sentence in the contract which mentions (somewhat in passing) that AEG will be entitled to recoup Production Advances from Contingent Compensation “otherwise payable to Artistco” – however this information goes unnoticed because the very next sentence diverts our attention to the Artist’s company being responsible for costs in excess only – “all such Production Costs which are “requested by Artistco in excess of the Production Advances”. 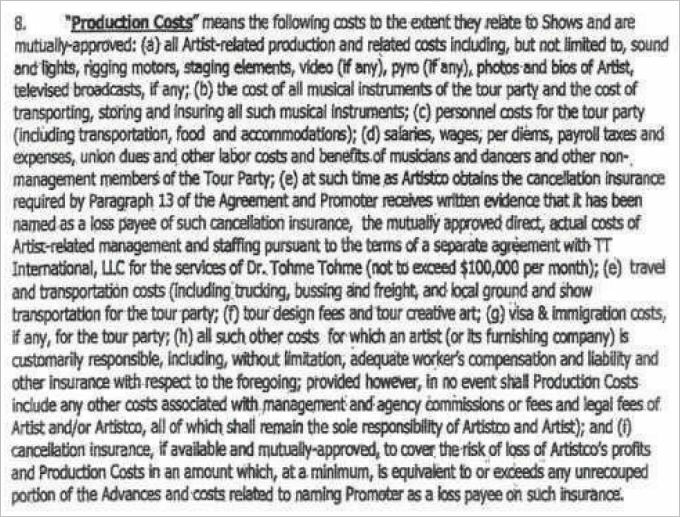 What is clear at this stage is that there is a difference between the excess production costs to be reimbursed by Artist’s company and the $7,5mln production costs (into which Tohme’s salary is included) for which some other conditions are set. For all the good AEG is doing to the Artist, AEG will receive a Producer’s fee which will be equal to 5% of the Artist’s Net Income. The Net income is what Artist keeps after he pays out everything. Now we are beginning to realize why the Artist was supposed to receive only 90% of the net sum due to him – the Producer’s 5% fee will be deducted from the remaining 10%. 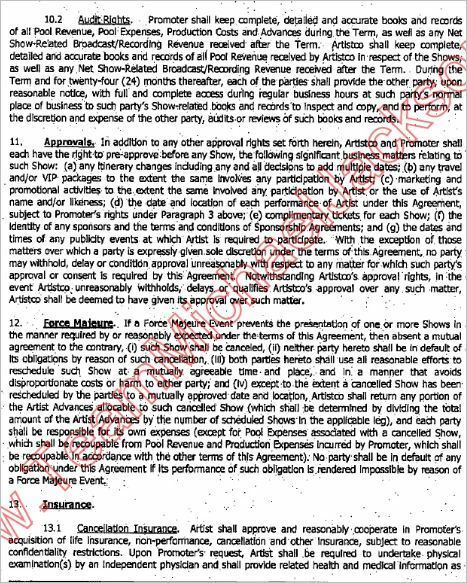 By the way the contract further says that as regards “recordation opportunities” in connection with “Artist’s performance at one or more Shows” the rights to it will be owned by the Artist and AEG will only jointly ‘exploit “the same and all derivations”. This made me wonder about the rehearsal footage – wasn’t it actually also Michael’s property which AEG was supposed to only ” jointly exploit”? And if so why did AEG sell it for $60mln? If Michael Jackson had the right to it, why weren’t those $60mln. used to cover his debt to AEG? Or do I misunderstand something here? The next page (page 9) says that AEG will make all the bookkeeping and the Artist’s company can check up their records. What it won’t be able to check though is whether AEG quoted the best prices for the services rendered – if the production costs are to be covered by Michael Jackson anyway is there a reason for them to economize? They are spending their money temporarily as it will be fully compensated by the Artist from the money he probably earns during this tour. All approvals concerning the dates, number of shows and itinerary will be jointly made by AEG and the Artist’s company (not the Artist). But the last sentence in point 11 shows that consulting Artistco is a mere formality. It says: “Notwithstanding Artistco’s approval rights, in the event Artistco, unreasonably withholds, delays or qualifies Artistco’s approval … Artistco shall be deemed to have given its approval over such matter”. So whether the Artist’s company does or doesn’t approve the essential elements of the tour it does not matter as it will still be considered approval on their part (this reminds me of our elections – no matter how or whether you vote the result will be the same). Force Majeure clause means the circumstances beyond the parties’ control. If such circumstances arise it is no surprise for us that the Artist is to return the “advance” for the show cancelled. Each party will be responsible for covering its own expenses. This point is vague as it is unclear what expenses are to be borne by the Promoter. What is clear though is that AEG will recoup even the Pool expenses because of the “exception” made for them. You wonder why AEG will have the pool expenses recouped to them only though the common meaning of “pool” is “joint”? Because the Definitions attachment (Exhibit A) will explain to you that pool expenses are actually AEG’s expenses! Page 10 is CRUCIAL again. It covers several insurances all of which are called “cancellation insurances”. By now we are slowly beginning to differentiate between them. It seems that both sides wanted to insure themselves against possible trouble – AEG wanted to insure itself against MJ’s illnesses and asked him to cooperate in obtaining the medical insurance for AEG. The Artist’s company evidenly wanted to insure itself against loss of its profits. Since production costs are also mentioned in this connection and AEG is named the beneficiary of such an insurance (“loss payee”), all the fuss around “production losses insurance” again creates the impression that AEG is worrying about its production costs and wants to have a guarantee that their possible losses will be covered by the insurance obtained by the Artist’s company. The contract says that in case AEG does not recoup all the “advances” from the Artist’s company, AEG will receive compensation for their losses from this cancellation insurance – however this will not relieve the Artist’s company from the obligation to pay back all the advances. AEG reassuringly says that it will keep the insurance proceeds temporarily – as soon as all the advances are paid back they will return the insurance proceeds to the Artist’s company. So what Randy Phillips was crying his crocodile tears over I do not understand – not only did they have an insurance covering the “unrecouped advances” from the Artist’s company, but they still had the right to demand payment of these advances, even though the insurance covered their losses. To me it looks like double safety for AEG. The cost of the insurance was by the way included in the Production Costs and so was the responsibility of the Artist’s company (only I am not sure that the Artist knew about it). “Termination” is also a VERY interesting point. The contract can be terminated within 10 business days in case of the “Event of Default” which for example, according to the Promissory Note, may happen when the Artist’s company does not make a “monthly scheduled payment” on time. Unfortunately the Note does not explain where this monthly schedule can be found as not a single paper mentions it. The Termination clause of course says that the Artist (the individual) and Artist’s company (MJ Company LLC) are to pay back the advances if the contract is terminated. This was probably the whole idea of their business from the very beginning of it – they suddenly terminate the contract and Michael has to pay back everything he has. But the next page is the most impressive of them all. It contains the so-called ‘Miscellaneous’ clause which generally is the least significant clause in all contracts. But not here. Over here it is the main clause of the ‘contract’. An agreement is integrated when the parties adopt the writing as the final and complete expression of the agreement. 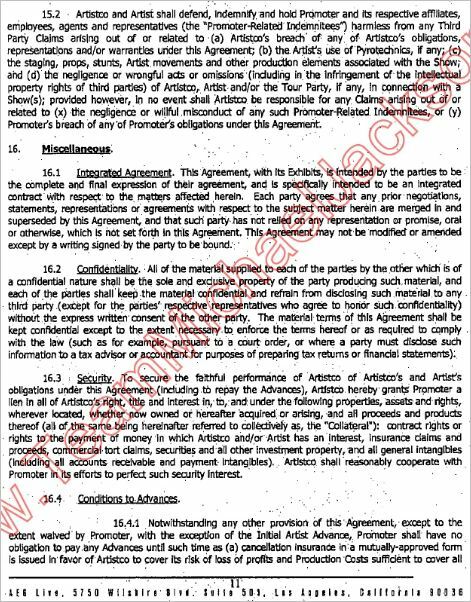 But AEG decided to correct the drawback of the last page and worked out into the middle pages of their contract a point about “integrated agreement” which says that the agreement is final. This makes us think that the first and last pages of this Letter of Intent are a kind of a “shell” the inside of which was later replaced by a new content. Next point 16.2 of “Miscellaneous” says that the “contract” is strictly confidential. Of course it was important to keep it a secret – how could AEG ever imagine that this BS would ever become public knowledge? 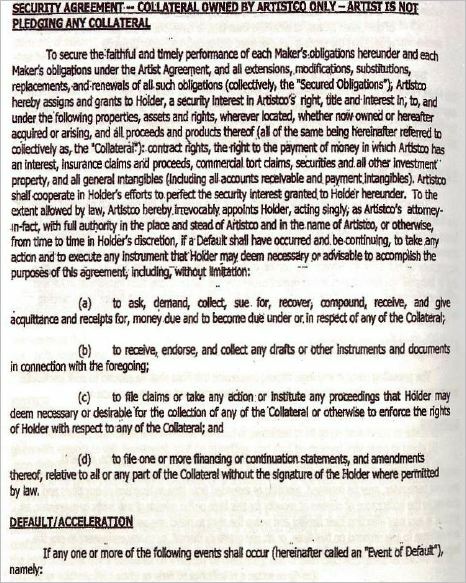 “To secure the faithful performance of Artistco of Artistco’s and Artist’s obligations under this Agreement (including to repay the Advances), Artistco hereby grants Promoter a lien in all Artistco’s right, title and interest in, to, and under the following properties, assets and rights, wherever located, whether now owned or hereafter acquired or arising, and all proceeds and products thereof (all of the same being hereinafter referred to collectively as, the “Collateral”): contract rights or right to the payment of money in which Artisco and /or Artist has an interest, insurance claims and proceeds, commercial tort claims, securities and all other investmenet property, and all general intangibles (including all accounts receivable and payment intangibles). Artistco shall reasonably cooperate with Promoter in its efforts to perfect such security Interest”. The main idea of the above is that the Artist’s company is responsible both for itself and the Artist. Therefore the Collateral pledged as a guarantee of their obligations includes everything the Artist’s company and the Artist had and will ever have. By now we know that Michael Jackson Company LLC did not own Michael’s share of the ATV catalog – however Michael Jackson the individual did own it, so I hope you will agree with me that the mere idea that AEG wanted to receive everything the Artist had or would ever have an interest in sounds somewhat unpleasant. This “everything” (the Collateral) was closely connected with the ability of the Artist’s company and/or the Artist to repay the Advances. As you know, by Advances AEG understood all the sums paid to Artist’s company but considered to be “Artist Advances” – which is another reason for us to think that Artist the individual was very much meant to be responsible for the money paid to his company and returning it to AEG in case of termination of contract. The so-called advances included the Initial advance of $5mln, plus $1,2mln for renting the house for a whole year, plus $7,5 mln. of production advances (spent by AEG, but meant to be covered by the Artist), plus all the money paid to the Artist for the shows already performed (the so-called Interim Advances) which were to be drawn from the $15mln. Letter of Credit opened for this purpose, plus some advances (probably) given by AEG to the Artist’s company to pay for several insurances, and what not! I really find it difficult to calculate how much the resulting sum could amount to. It might have been astronomical and the “best” part of the story is that all this would be technically considered the advance money though at least part of it was earned by the Artist! The advances were to be paid back within 10 business days from the moment of a possible Event of Default which could arise any time, for example if the very first “monthly payment” was not made. No one knows where the schedule of these “monthly” payments is, but everyone knows that the contract allows termination of the AEG business relations with Michael Jackson very easily. We even have proof that AEG tentatively tried this variant. The idea of termination was voiced by Randy Phillips to Michael Jackson when he threatened him to “pull the plug”. This was exactly the situation after which an Event of Default could arise. And what could be the result of that event? The Artist’s company and/or Artist individually could part with the Collateral which included everything the Artist’ company (and Artist himself) ever had or would have in the future! approve the tour itinerary “pertaining to such Advances”. This is a diplomatic way of saying that if the Artist (his company) wants to receive any money at all he should approve the future itinerary by all means. Please remember that what AEG considers advances, the rest of us consider hard-earned money – but even this earned money will be denied if the future itinerary is not approved. Severability point is potentially dangerous to the Artist. It means that if one clause of the contract is found invalid all the others will still be effective. Considering the numerous points of this contract where AEG stretches the truth to an impossible degree, severability may force the Artist to follow its clauses even if part of them are found invalid (unless the whole “contract” is found void of course) . As regards the infamous “Notices” you already know that all approvals could be sent by the Artist’s company (Tohme) simply by fax and after that the matter was considered settled. This was evidently the way the initial 10 shows miraculously turned for Michael Jackson into 50 shows overnight. The next page ( page 13) pretends to be the official addresses of the parties every contract closes with and under which the parties put their signatures. However in this particular case the addresses simply show through whom correspondence is to be carried out. You won’t find the name of Michael Jackson or his lawyer here – firstly, there is no lawyer for Michael Jackson (Peter Lopez was fired by Tohme (?) from this project, but continued to work for MJ on other deals) and secondly, Michael Jackson as a human being, head of company or party to the contract is non-existent according to this page. 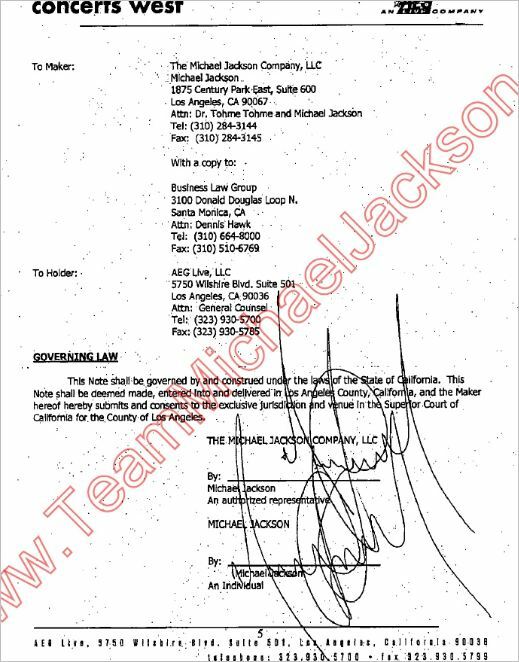 All we see here is Tohme Tohme and Tohme Tohme again (together with his lawyer Dennis J.Hawk) and no trouble is taken to explain who Tohme is both for this contract and Michael Jackson Company LLC he seems to representing. No differentiation is made as to who works for which party in this contract. We simply have to guess that Tohme is to send decisions on behalf of MJ’s Company to the “General Counsel” of AEG Live and Kathy A. Jorrie, while they have to send their decisions to Tohme, Tohme and Dennis Hawk. Kathy Jorrie testified at Murray’s trial and impressed me very much by finally admitting that even before Murray was employed, AEG sent to Murray a list of medical equipment to be provided for Michael Jackson. This makes me think that they knew about that propofol business much more than they cared to admit. 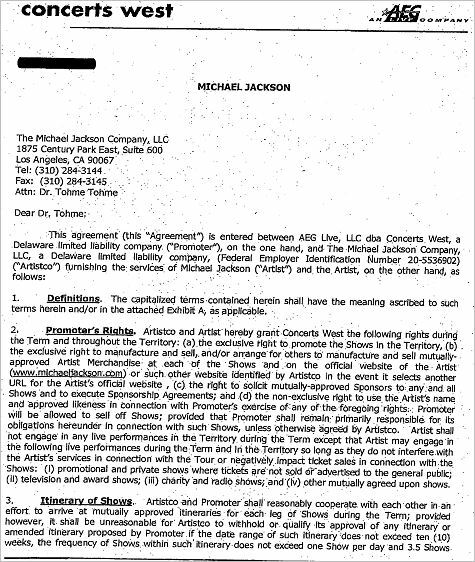 Finally, let me say that with so big a presence of Dr. Tohme Tohme in this contract it now becomes clear why he didn’t want to leave the stage even after being fired by Michael Jackson in March 2009. 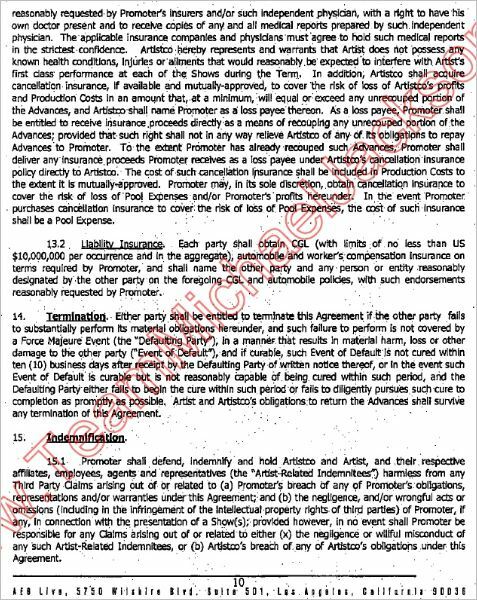 Since most of it is revolving around Tohme the whole AEG “contract” was to be rewritten after that! The next page (page 14) is famous for the sentence closing this so-called contract. It says that the parties have agreed to the “foregoing” , but now will have to proceed to further negotiations to expeditiously reach the definitive agreement – and this automatically means that EVERYTHING you’ve just read is absolutely NOT FINAL! 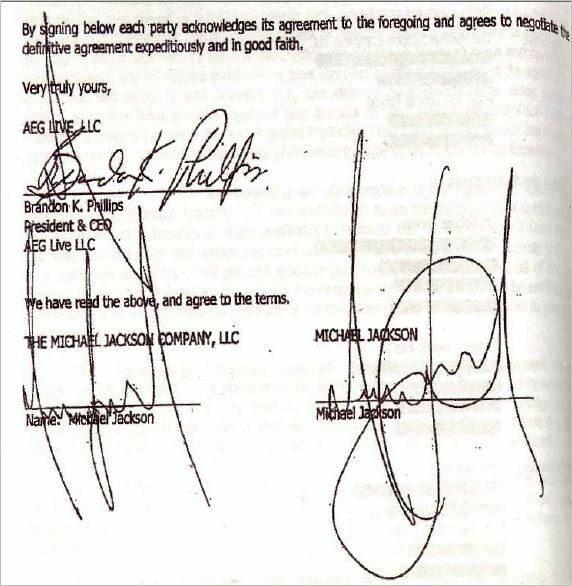 The other attraction of this page is the dramatic difference in Michael Jackson’s signatures – the one as an individual (on the right) and Michael Jackson as a representative of MJ Company LLC (on the left). 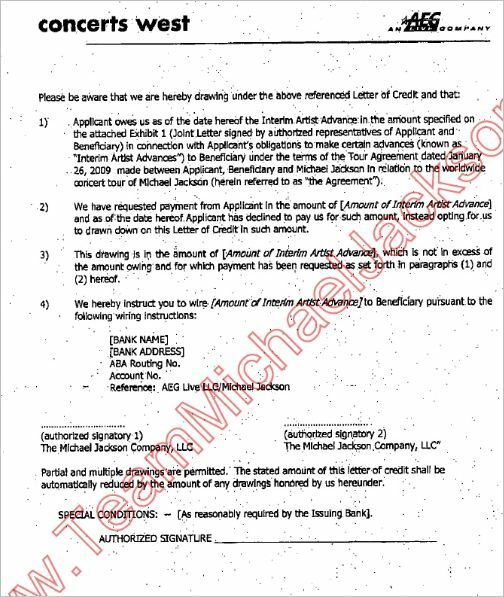 Indeed, in comparison with all other Michael’s signatures in the AEG’s papers (making up this agreement) his signature for the company looks decidedly different from the rest of them and makes us suspect the worst – that it is forged. Or it might be the other way about. The signature for the company might be correct, while all the rest of them may be forged – so it is up to you to choose which variant you like best. Randy Phillips also signed this page after saying to Dr. Tohme “Very truly yours” – which is a very nice ending for this ‘contract’. Next comes Exhibit A which explains all the terms used in the paper we’ve just read. It is called “DEFINITIONS”. Definitions are crucial to any contract as its meaning wholly depends on how the parties define the main terms. Definitions are usually stated in the body of the contract as “attaching” them afterwards may fully change the meaning of the text written before. 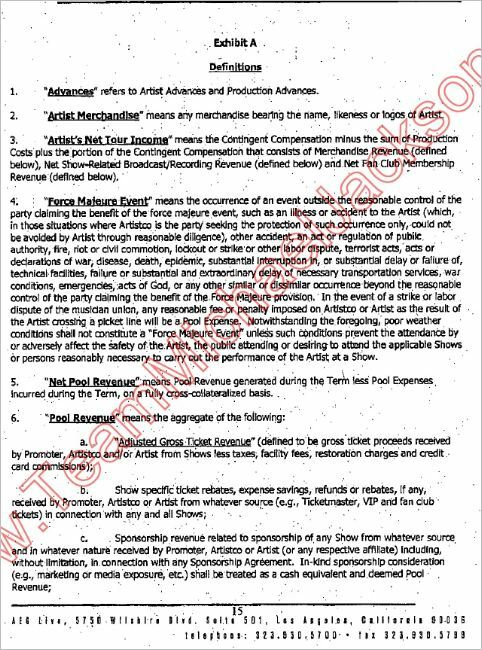 The attachment provided by AEG does not have a date or signatures of the parties which were supposed to agree on these definitions – so we do not know when it was attached or whether Michael Jackson saw it at all. I’ll go over only the main points as it is discussed in some detail in this post. 1) The first thing to notice is that this Definitions attachment is the only place which does not even say, but implies that Production Costs are to be the Artist’s responsibility. AEG speaks about it in a round-about way – “the Artist’s Net income is his Compensation minus Production costs”. Pool Revenue is everything they collect. Net Pool Revenue is everything they collect minus Pool Expenses. Pool expenses are the expenses incurred by Promoter. So when all the money is collected AEG deducts their “pool” expenses and gets a huge 10% of the rest. It is huge because it is one tenth of the overall sum of all the money made. But the 90% remaining to the Artist still includes the sum of Production costs. The Artist is to deduct this pile of costs from his share (and pay it back to AEG) after which he is left with very little. Then he deducts all the other “advances” he received earlier and is left with even less. This balance becomes his Net Income. Then he gets only 90% of his net income, because the remaining 10% are needed by AEG for deducting their 5% Producer’s fee from it (see page 8 above). We can be more or less sure that the rest of 5% will also go in the same direction under another ridiculous pretext. Please compare the above scheme with a normal way to divide the profit (first people deduct the expenses and only then proportionally divide what’s left) and you will see the difference between the two. Even without calculating the actual sums the end result is clear to us – AEG does practically nothing but gets a lot, while the Artist does almost everything but gets very little. However for the inquisitive minds I suggest some calculations. Let us assume the parties collected $100mln. Out of this sum AEG gets $10 mln. The Artist seems to be getting $90 mln. Then the Artist deducts all production expenses from his share. It must be more than $30mln (judging by what Randy Phillips complained about). However production expenses will only grow with each show due to personnel costs, travel expenses, etc. added with each coming day, so the final figure may be even more impressive. The compensation for these production expenses goes back to AEG – so what they spent fully returns to them. This means that out of the $100 mln collected their share of money rises from $10 mln to $40 mln, and though they were nominally producers of the show they did not spend a single dollar on it (except some minor costs). The show was fully paid for by the Artist. Then the remaining sum due to the Artist ($60 mln.) is to be reduced by the so-called additional advances which were given to him as his earnings, and as payment for the rent, salary of Tohme (and Murray? ), and payment to third companies like the 2 Seas Records. We do not know how much it could amount to, so we will call it an X-sum. It may be $10, 20, 30 mln. or more millions out of the overall $100 mln. we took as an example. After deducting the X-sum we finally arrive at the Artist’s Net income. How much can it be now? $40 mln, $30mln. or less? But even out of this sum the Artist gets only 90% (according to point 4 of the contract)! Off another 10% go as at least 5% of the Artist’s Net Income is Producer’s fee and the remaining 5% will also apparently go into AEG’s pocket as point 4 of the contract says that “Promoter shall retain all other Net Pool Revenue”. So if we assume that the Artist’s net income was $40 mln., AEG will get the additional $4mln out of it. It is a tentative figure as it is provided as an example only, but its comparison with what is paid to AEG shows that the Artist’s earnings are almost twice as little as AEG’s profits! 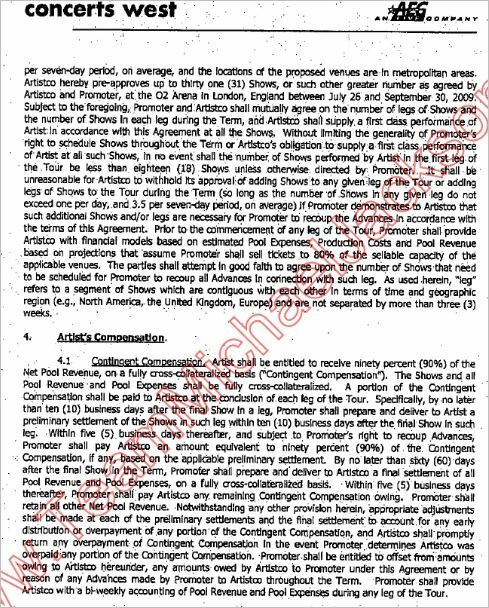 To understand the full meaning of the AEG deal with Michael Jackson, the best entertainer in the world and the pride of the nation, you should do your own study of his Contingent Compensation on page 2 of the contract combining it with the Definitions attachment. Or read this post please: Michael Jackson’s agreement with AEG – FRAUD IN THE ARTIST’S COMPENSATION. part 3. The only correction I would make to that post is that the sum of all Production costs to be returned by the Artist was to be ADDED to AEG’s share! How could I forget that this money, taken from the Artist’s earnings, would not go into thin air but into AEG’s pocket again?! Page 17 of Exhibit A (“Definitions”) provides the staggering list of production expenses to be covered by the Artist. It is easier to say what is NOT to be covered by him because EVERYTHING is his responsibility. Everything done on stage is his responsibility (sound, lights, staging elements, videos, pyro, etc. ), everything regarding the personnel is his responsibility (salary, taxes, food, accommodation, visas, travel, local transportation, etc.) , everything concerning the instruments, their transportaion and storage is his responsibility, trucking, bussing and freight are his responsibility, tour creative art is his responsibility, all cancellation insurances issued for the benefit of AEG are his responsibility, and of course Dr. Tohme Tohme’s monthly $100,000 salary is now his responsibility too! The Territory and Term are exceptionally important, so they will be repeated here too. The Territory or in other words, the World means that AEG had far-reaching plans for Michael Jackson (in case he survived the first 50 concerts of course) and the Term means that AEG was going to make him work for them for at least two and a half years until December 31, 2011. After that a very strange thing was to happen – AEG could “in its sole discretion” extend the period further and set any number of shows until “all the advances were recouped”. This takes us completely by surprise – they can add new shows unilaterally and practically admit that even after 2,5 years of working with them the Artist could still be unable to pay back the advances! The trick by which they could add more shows was primitive and rude. 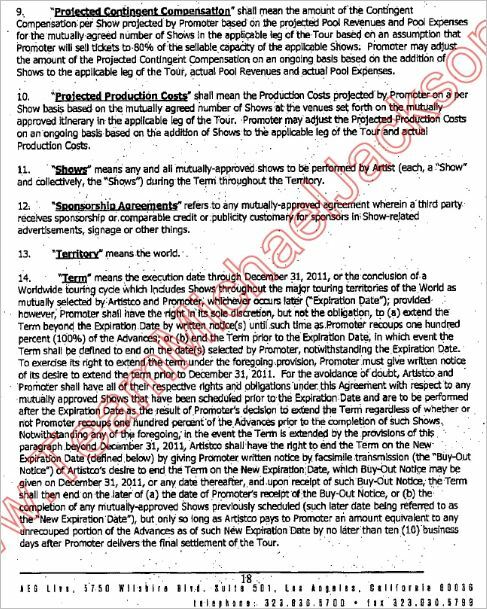 AEG could increase the number of shows PRIOR to December 31, 2001, while the Artist’s company had the right to express “desire to end the Term” only ON December 31 when all new shows had already been added by AEG! To get rid of AEG the Artist was to submit a BUY-OUT NOTICE (!) 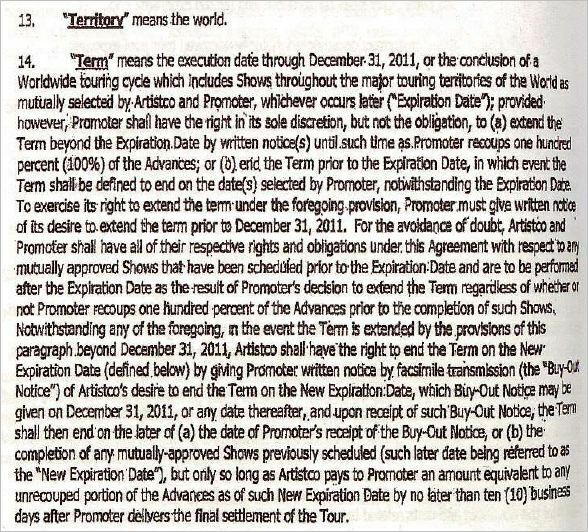 on or after December 31, 2011 and this Notice was to finally release him of this burden … but not until after he completed all additional shows and paid back the advances still “unrecouped” by AEG! What is even more incredible is that AEG didn’t want to allow the Artist to leave this “joint business” of theirs even in case the Artist had already paid all the advances back ! The attachment explicitly says it – the Artist is to do additional shows “regardless of whether or not Promoter recoups one hundred percent of the Advances”! Was it meant to be SLAVERY? Below is the last page of Exhibit A (“Definitions”). This is how attachments should be made if you want to cheat on your partners – no date, no signatures, no nothing. This way you can add ANYTHING to it and at ANY time too, changing the meaning of what you have agreed about in the contract proper (of course if the judge allows you to). The next attachment is Exhibit B called “Inducement Letter”. The page enumeration starts anew. 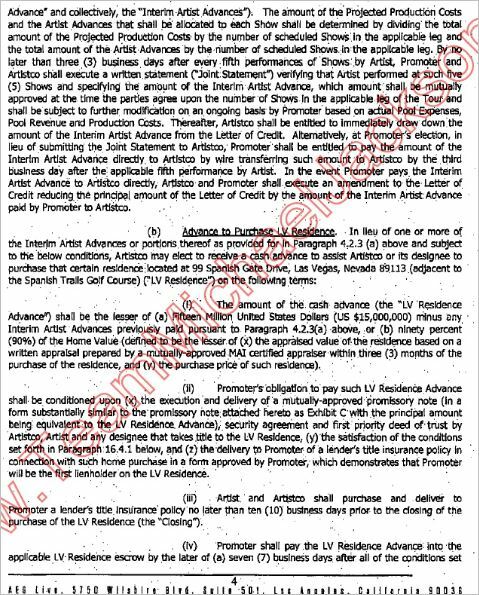 The next attachment is Exhibit C , called Promissory Note. The date on it is put in handwriting. 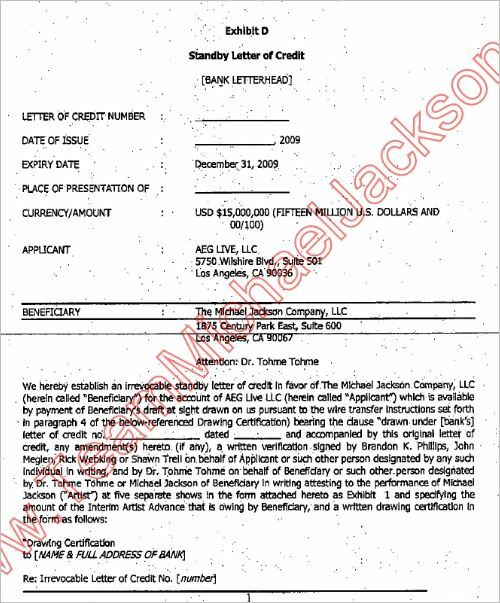 The Note is crucial as under this very document Michael Jackson received the Initial advance and pledged as collateral everything that belonged or was to belong to his Michael Jackson Company LLC. 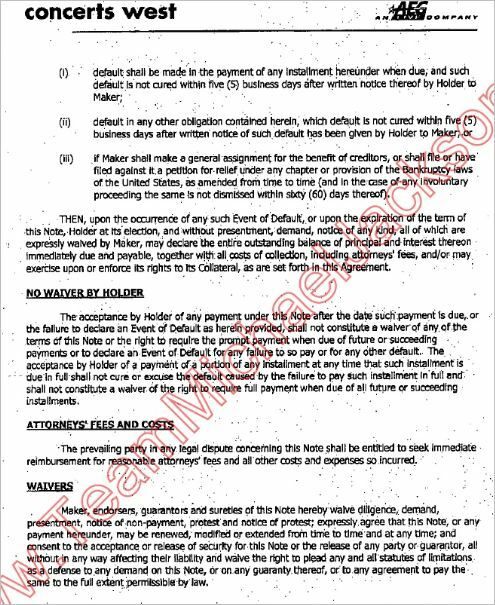 Page 2 of Exhibit C (Promissory Note). Here comes the COLLATERAL! We can argue over the value of the Michael Jackson Company LLC as the Collateral in 2009 or in the future, but it doesn’t really matter much. Out of the many points specified in the Promissory Note the major one is that if it came to the worst AEG was to become an attorney-in fact for Michael Jackson’s company with “full authority” to take any action – up to “filing financial statements relative to the Collateral without the signature of the Holder” (Michael Jackson). Please note that the MJ Estate’s report of February 17 , 2011 disclosed that Michael’s liabilites to AEG reached the excess of $40 mln. and it was extremely difficult for him to pay back this huge sum in case they suddenly terminated the contract – unless this “contract” of theirs was not found void of course. Page 3 of Exhibit C Promissory Note gives to the Artist NO CHANCE TO ESCAPE. The next page suddenly mentions that the advance money is to be paid back in “monthly regular payments”. As almost every word in this deal this phrase is top important again! The previous page has just explained to us that if one portion of payment is not done on time, 5 business days later it will be called an Event of Default – and this will allow AEG to demand the whole sum of the advances to be paid immediately. You surely didn’t notice it, so I am repeating one of the above points again. They claim that “herein” regular monthly scheduled payments are required. The implied schedule is a really big deal because if MJ breaks it by 5 days there will be a major default! But where is the schedule of payments they are talking of? The next document is Exhibit D (Letter of Credit for $15 mln.) under which Tohme will receive money for the shows performed on behalf of the Beneficiary (MJ Company LLC). And this is the last attachment (Exhibit 1) which is the form to be filled after each 5 shows performed. It states the so-called Interim Artist Advances which are actually the Artist’s hard earned money. Well, at least in this paper AEG does not misname it by the word “advances” but has the decency to call it the money AEG owes to the Artist’s company for the job done. Is your hair standing on end after reading all this? Mine is! So what these papers testify to are only the intentions of AEG towards Michael Jackson. And you see for yourselves that these intentions were horrible. Since ALL productions costs were to be at Michael Jackson’s expense this point needs to be repeated. 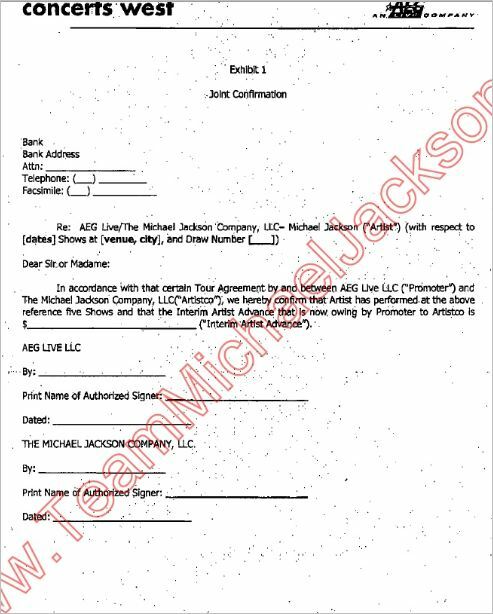 Let me also remind you that the “definitions” attachment is not signed either by Jackson or by AEG. Exhibit A “Definitions”, page 17. This is how attachments are made if people want them to be “flexible” – no date, no signatures, no nothing. This way you can add ANYTHING to them at ANY time and no one will notice it. Apparently some space has been left in reserve for future additions to change the interpretation of the main contract (Exhibit A, “Definitions”. Page 19). Exhibit B “Inducement Letter”, page 1 (the enumeration suddenly starts anew). Now this paper looks to me even more ridiculous than ever – it is an inducement “to enter into” the agreement signed on January 26, 2009. How can it induce anyone to enter into an agreement which was already signed? No surprise that this paper does not carry a date of its own. Exhibit C Promissory Note. Page 2. HERE IS THE COLLATERAL! 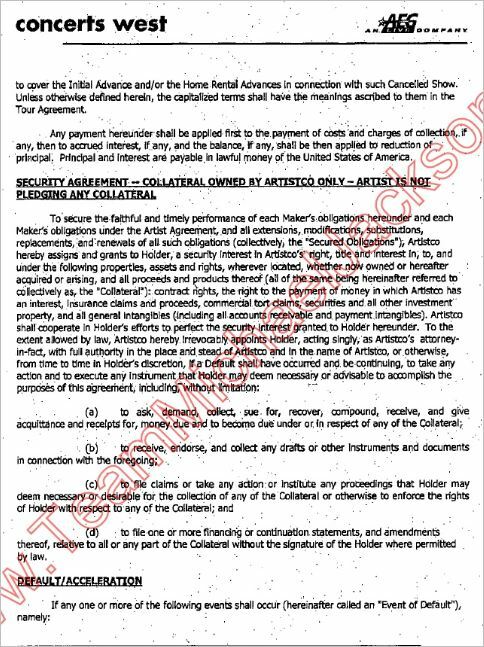 The point of the Collateral (and Default) is so important that I am repeating it here in better quality (Exhibit C Promissory Note, page 2). What “monthly regular payments”? Why in prepayment clause? Where is the schedule they are talking of? (Exhibit C Promissory Note, page 4). Look at the way this article is structured, it is a shortened variant of the LATimes article. One paragraph says that Michael denied authorization for another medical check-up and the next (last and crucial) paragraph says that less than a hour later he stopped breathing. This way they want to implant in readers’s minds a LIE that Michael was afraid of the medical check-up and took his life himself! Dr. Shaffer provided the full and final proof during Murray’s trial that Michael COULD NOT self-administer propofol. It was simply technically impossible to do it. After the initial dose (which Murray admitted) wore off, MJ was to stand up, go to the closet (dragging the IV stand after him), then bring an 200ml bottle, put it on the stand, start pouring propofol and LIE ON THE BED after that. And this in spite of the fact that a few seconds after propofol starts streaming the patient gets unconscious! MJ would have been found on the floor had he taken it himself! No, the situation is exactly the opposite. The medical check-up was looming and AEG started panicking. All their previous statements about Michael’s excellent health would be turned against them – how come Michael reached that horrible state within several months only and while he was under the care of a doctor hired by AEG? 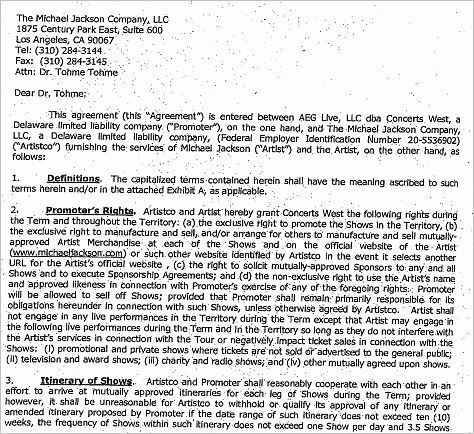 Here is some more information for those interested in the AEG contract with MJ. This page now has a fuller version of the same post which contains my commentary on the contract. Those of you who are interested only in the contract papers (with no comment) please scroll down to the end of the post which has the screen shot of each page. sounds like work for the justice dept. 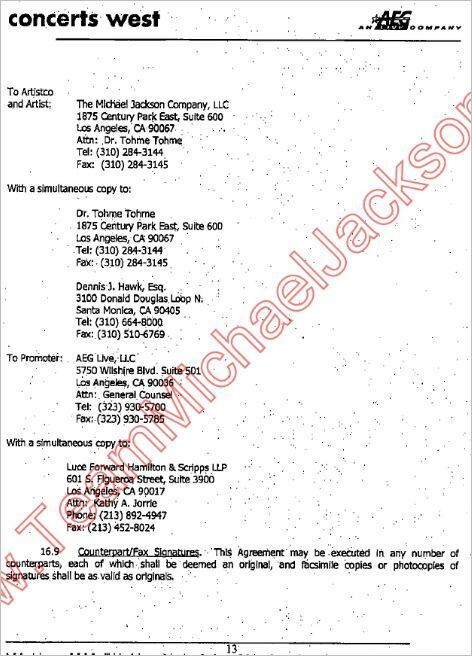 The so-called contract between AEG and Michael Jackson? Yes, it does. Only I am not sure they will be interested, same as they are not interested in the criminal prosecutor who defied law and human ethics when prosecuting Michael for half of his life. The sorry story of AEG and Michael Jackson goes back to it´s very beginning. It is full of lies and deception,macabre things happening to Michaels private residence before the memorial. It may have begun before the meeting with Thome, Thomas Barrack and Michael in Lasvegas.I wonder whose idea it was to leave out the word “ethical” when asessing Murray. It is expensive to make movies, but we can not give up and let this pass.Now Michael is dead and those responsible feast. Thank you Kaarin22, for this comment. I agree with you. For me “lies from the very beginning” is this contract. This contract is on paper, it is concrete, it will never go away, you just have to read it, it is self-explanatory. And this blog has analysis! And I, for one, cannot believe, that at this point, Thome is still in the shadows. The 2005 trial is on public record. But the truth of the 2005 was buried by the media. In order to know the truth about Michael Jackson’s 2005 trial and the allegations, one has to study the 2005 trial’s transcripts. Unfortunately, the 2005 trial brought in Michael’s 1993 allegations and his finances, and the conspiracy allegations, etc. BUT, this all was a blessing in disguise, because the testimony brought in information that exposed Michael’s enemies, and it went into the public domain. In 2013, the clues to the events of Michael’s death are buried in the transcripts and depositions of the AEG trial. The 2011 Murray trial transcripts and cameras in the courtroom are available for further clues. Again the media spun its web in both of these trials. If it was such slavery why did MJ signed ?!? Who told you that he signed it?